These nutritious crisps are easy to make and full of flavour. They’re loaded with plant protein and a portion contains 12 grams. Nutritional yeast gives a cheesy nutty taste to these dairy-free crisps. 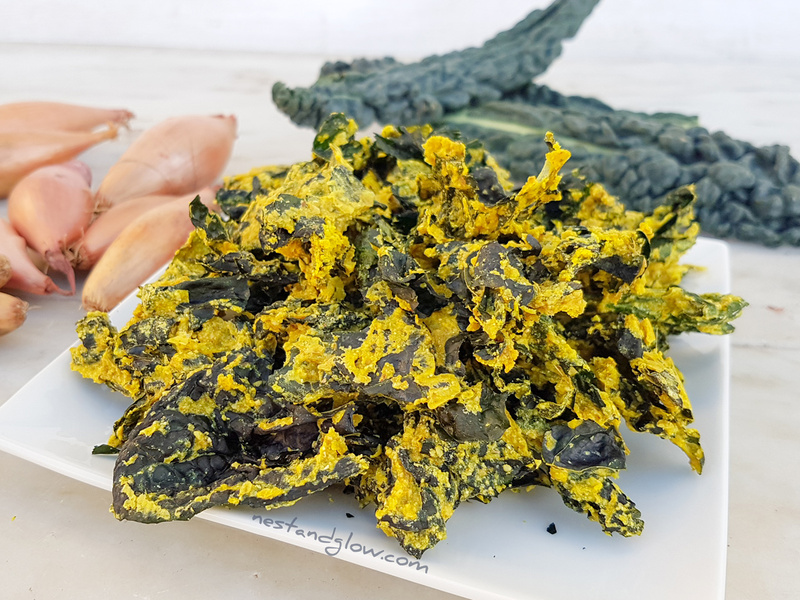 They prove to be popular with everyone – even those that don’t like kale as once its dried it just becomes a crispy base and doesn’t taste of kale. As they are nut-free they are quite wallet friendly. Suitable for vegan, dairy-free, nut-free, gluten-free, paleo and general healthy diets. Leafy greens are very nutitious and loaded with vitamins, minerals, protein and fibre. Kale crips/chips are a great way to get more greens into your diet. Soak the sunflower seeds in salted water. Overnight is best but 15 mins will do. Rip the kale off the stems. Sprinkle over the kale a pinch of salt, oil and apple cider vinegar. Scrunch and rub the kale until its halved in size. Pour the cheesy sauce on the kale then massage to coat all the leaves. Bake; spread out thinly onto a lined tray and bake at 300F / 150C for about 20-30 minutes. Toss every 5-10 minutes and take out of the oven as soon as they are dry. Don’t leave the ovens side as they burn easily. Enjoy the kale crisps straight away. They can be stored in an airtight container, but it’s best to have them the same day as they lose their crispiness. View the fast video recipe. You can either make this recipe in an oven or a dehydrator. The oven version is quicker but you do have to watch carefully as they burn very quickly. The dehydrator version is foolproof to make as you can’t burn them and they are more nutritious as heat hasn’t destroyed any of the goodness. I always make the dehydrator version as its so easy to make a huge batch. They will last for several weeks after being cooked but they may lose some crispiness. 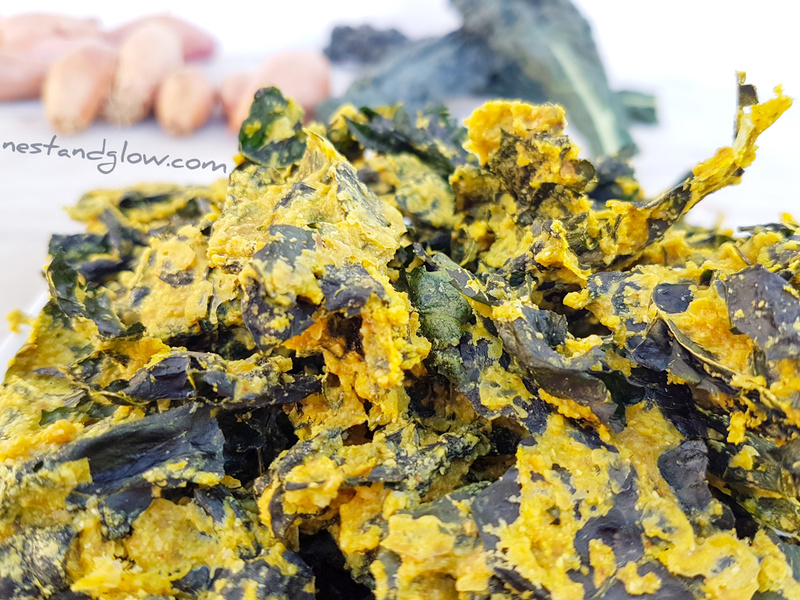 You can place back in the oven or dehydrator for a short time to crisp up soft kale crisps. In the photos and video I used black kale to make these but any variety works well. To get the freshest kale buy it still on the head and attached rather than prepared. This recipe does contain a small amount of oil that helps even the raw crisps get really crispy but this is optional and you can leave it out to be oil-free or reduce the calories. Check out my smoked kale crisps if you like smoked paprika.